When Penelope moves to a new school, she tries her best to follow the school survival rules, first of all, don't get noticed by the mean kids. 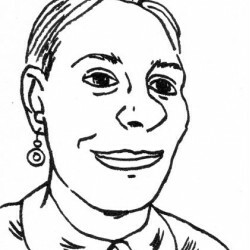 Of course, that fails almost immediately when she trips in the hall to universal laughter, then gets helped up by an unpopular kid, Jaime. After shoving him away, Peppi feels bad and wants to apologize, but the longer she waits the harder it becomes, until she's jumping behind rocks just to avoid him. When he is assigned to tutor her in science class they end up becoming friends. Meanwhile, Peppi's art club buddies and Jamie's science club are at war. They have one chance to prove who deserves a table at the school's club open house and the two groups of kids are falling back on mean tricks to win. Lessons are learned, bullies are bested and friendship wins out in the end. 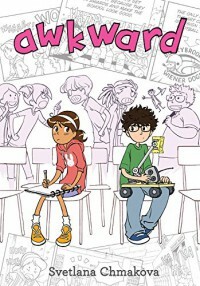 Awkward is a sweet middle school story that fans of Raina Telgemeier will appreciate. I really enjoyed the diversity of the characters represented at the school and the sentiment of the story, but some of the dialogue was a bit dated. I also really enjoy that the first thing Penelope did was basically screw up and support the bullies. She has to work hard to get brave enough to apologize to Jaime and to confront the bullying at the end of the book, so it's okay not to be perfect, or good all the time, it's okay to make mistakes as long as you do your best to learn from the mistakes, apologize and move on. I would definitely give this out to the kids, good stuff!